Parents are a key part of the BISL community, and not just for bringing their children to and from school and making sure they do their homework! establishing other connections with the broader community. Every month all parents are invited to join the Principal and PTA Committee at a Coffee Morning to find out more about how things work at the school (anything from exams to sport) and planning future PTA events. Everybody is part of the PTA, everyone is welcome! When new children enroll at the school parents are invited to join Classlist, and on top of their children’s class group (where they can post about homework, trips or birthdays) they have access to a wide variety of groups which can help them find and share useful information, connect with other families who speak the same language or share an interest in a sport or activity. If a PTA parent, teacher or staff member has an idea for a new group they are free to create one! English Booster, if you are not very confident in English, there’s no reason why you should miss out! Qualified PTA parents and teachers from the school can help you improve your English. Discover Slovenia, visits have included boating on Bled, walking the Vintgar Gorge and riding bikes around the Pot Ob Žici Remembrance Walk. Šmarna Gora, there are regular morning hikes up this iconic hill, just outside Ljubljana. A great way to get some cardio exercise, great views and have a chat. Ski and Snowboarding on Krvavec, you can make the most of fine midweek weather and get in some sunshine on the pistes, just 30 minutes away! Pilates, Yoga and Fit Club for Parents. Book Club, sharing your love of reading. Foodies, sharing inside knowledge of local eateries and specialities. New Families, a support group for those new to the school and the area. helping in their child's class to prepare for special PTA events like Christmas, Book Day or International Day. giving presentations in school and organising visits to various places of work or interest. The school also offers a number of activities for parents. Music lessons as part of British International Music School (BIMS) and our parent-teacher bands and choirs are well-established. 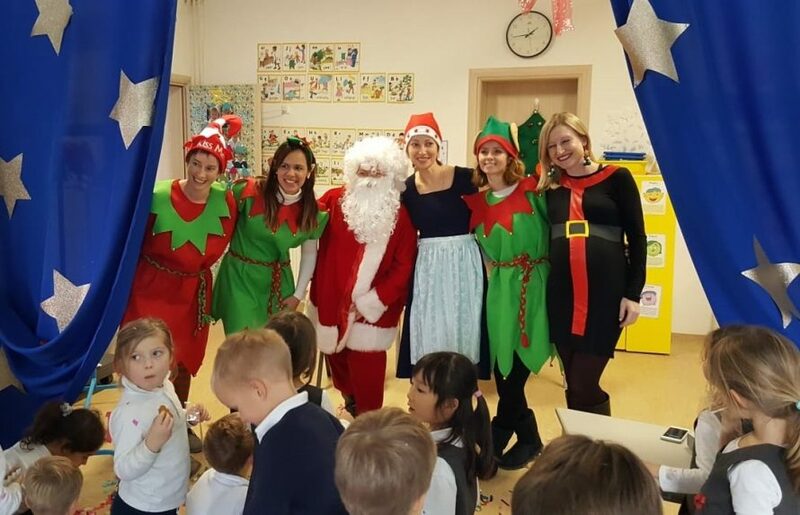 If you wish to take a role in the PTA, volunteer for school events, or if you have any suggestions or comments on the working of the PTA, please feel free to contact the PTA chairperson at pta@britishschool.si. BISL parents can find out about everything the PTA does by joining Classlist. This is the official community platform for the BISL PTA which is GDPR compliant, placing extremely high importance on privacy. It allows you to connect with other parents in your children's classes and you can choose what you share and how and when you wish to be notified. There are also groups to help you meet parents with similar interests and a marketplace for exchanging clothing and toys, not to mention invitations for events, workshops and parties. Research shows that having parents active in their child's school life has a positive effect on their children's development and the importance of having a sense of community for expats is essential for the family's adaptation and success in their host country. Through the BISL PTA you can not only help your child succeed, but help the whole family grow. Evening Social Events - Party! Classlist is where you will find all the details about events, also enabling you to contact other parents through your children's class or interest groups. As soon as your child is enrolled you can start connecting with the school community, asking questions or getting involved. Although not everyone is used to the concept of the PTA, you will find that it is a great way to enrich your family's life and support your children's education. We look forward to meeting you on Classlist and at an event soon! We are delighted to share with you our first Community Directory of useful businesses recommended by our community. This is available for everyone to access, will be updated regularly, and shared with new families upon their arrival.